Greetings after a long absence. I have been very busy preparing for the academic year and participating in St. Louis community events. In the second week of August, I spoke at CAJE (Conference on Alternatives in Jewish Education) which held its annual meeting in St. Louis and on the campus of Washington University. It was a lively and well prepared event. My presentation in this conference was an important experience for me. I am looking forward to staying connected with educators in the American Jewish community to share information and work for better communication and understanding between our respective communities. I also was very much involved in the three day annual convention of VFP (Veterans For Peace) held here in St. Louis last week. Together with my friend Alice Bloch, I gave two workshops. I also had a keynote address about Iran. Alice and I both felt very pleased and honored to have been a part of the VFP convention. If you have written to me recently, please note that – emerging from these events and also preparing for the academic year – I will need a just a little more time to write back. Popular Iranian singer Elaheh, the "woman with a velvet voice." On August 17, the popular Iranian singer Elaheh passed away. As a pre-revolution Iranian woman singer, Elaheh’s songs have not been played on national Iranian radio and television. Nevertheless, Elaheh remains a very familiar and popular voice particularly for Iranians of my generation. She was known as “the woman with a velvet voice”. Here, I would like to share with you one her hits Rosvai Zamaneh Manam. Click to Listen. A week after President Karzi embarrassed the current U.S.
consolidate areas of cooperation such as combating drug traffickers. Another painting by Hannibal Alkhas (click the link on the left for more of his terrific work). I would like to revive our old tradition of closing these windows with a painting exhibit. 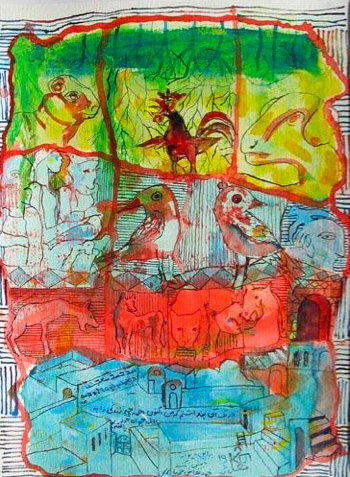 This one is a very recent show of the watercolor works of Hannibal Alkhas (b. 1930). An Iranian Assyrian artist of great stature in the Iranian art community, Alkhas has worked with many different media and styles of painting. He has also worked with wood. I’ll leave the show to speak for itself. Since it is the only visual attachment, I hope it won’t be too large for your computers. 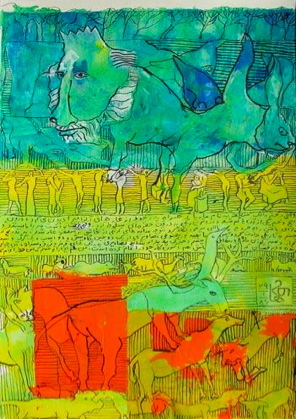 Click here: Hannibal Alkhas Painting Show.